A look back at the Movie Tie-In Cartoon! When I was a kid, with only four TV channels available, I would often be lucky enough to catch the rare and largely unseen movie tie-in cartoons on Channel 4. These cartoons were designed to continue the adventures of the characters that had featured in the successful movies of the 80s an early 90s. They were probably very poor, never featured any of the actual actors doing the voices and would eventually be cancelled after one season or even ten measly episodes. Two 80s classics were based on time travel. Back to the Future and Bill and Ted had potential. The characters could go to different times or places as the series went on. Back to the Future even introduced Doc Brown’s kids so they would have some appealing children getting in trouble. Other movies worked well for these cartoons too. 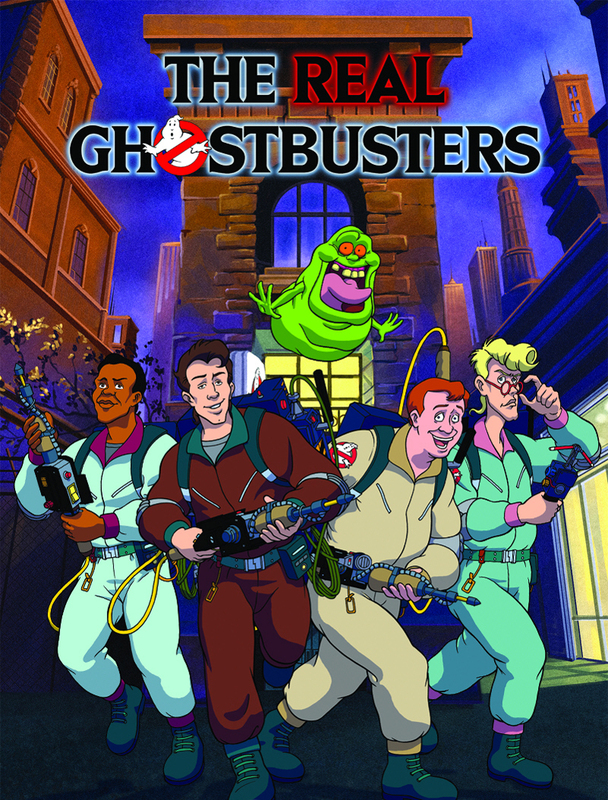 Ghostbusters is probably the most well-known hit and worked because the premise lends itself to a weekly, kid-aimed show. Arguably, to some kids, it was a bigger deal than the film itself. Other Saturday morning cartoons would have less favourable movies to link too. The Karate Kid got his own TV series, as did Teen Wolf. Both quite poor and had little to do with the films they were based on. Of course there were cartoons where this had to be the case. The 80s and 90s brought movies based on ultra-violent or just purely inappropriate films to aim at kids. Both Robocop and Rambo spawned their own cartoon tie-ins. Robocop was an easy transfer, having the ultra-violent half-man, half machine fight different criminals in a futuristic Detroit each week. Rambo was actually a poor GI: Joe/He-Man mix where he isn’t a grizzled, PTSD suffering Vietnam Vet but instead the leader of a team of commandos and fighting an evil villain from the acronym crazy S.A.V.A.G.E! Rambo is a bizarre choice for a cartoon! It didn’t just have to be ultra-violent action-heroes though. The Toxic Avenger had his own show, with him leading an environmentally conscious team of Toxic Crusaders. No violent, disgusting Jock killing though. The theme of more adult movies getting the kid’s cartoon treatment continued with Beetlejuice, who was more of a good-natured imaginary friend than the dark, sinister spirit played by Michael Keaton. The strangest movie tie-in than most was the quite cool Godzilla cartoon based on the 1998 film. It had the not-so-classic Godzilla design and had the creature facing different monsters each episode: not too unlike the plot of the latest movie to be honest. The last two examples I will use are actually solid favourites of mine. Just as I was becoming a little too old for cartoons, a very credible version of Men in Black was released. Seemingly based more on the comics than the movie, it was a perfect mix of the movies humour and cool sci-fi which captured my imagination. Although not technically a direct movie tie-in, James Bond was given a nephew who had his own adventures: James Bond Junior. I loved this show too and although it was fairly short-lived, I even had one of the toys! Not sure it would hold up too much now though! Overall, we seem to be past the point of the movie tie-in cartoon. Besides the superhero genre, you don’t get the same cheap, almost knock-off imitation like you did in the 80s and 90s. It is a shame too because films like Pacific Rim or The Hunger Games could easily make the transfer to the small screen animation. A strange choice for the cartoon treatment?! Thanks. I only scratch the surface too. You begin to look into this and there are loads. With the Teen Wolf family? I don’t remember it fondly but I’m sure there are people that think the same about James Bond Jr.